so close to flush!!!! OK so I think everything is going great! I'm guessing/ hoping the yellowing leaves is just the plant nearing the end. Though why is just the one plant starting to yellow already? Gonna get a little 24x24x48 drying tent. I'll move the carbon filter there for a couple weeks. wont need it in the big tent for a few days. Hope I'm not forgetting anything here. I'll go over the comments I'm sure its in there, but if its not, how do I know when to start the flush??! and do you only give water? I use RO, do you check the PH and adjust that and thats it? You can see in a couple pics the plant on the right is much shorter and the colas are all rounded. weird. My plan for harvest. was planning on using that drying tent...... with a osculating fan at the bottom? or not needed? At harvest I was gonna cut off branch, trim the fan leaves only then hang upside down in the tent. trimming the sugar leaves after drying before curing. All G?? Hi there! Great diary bro! 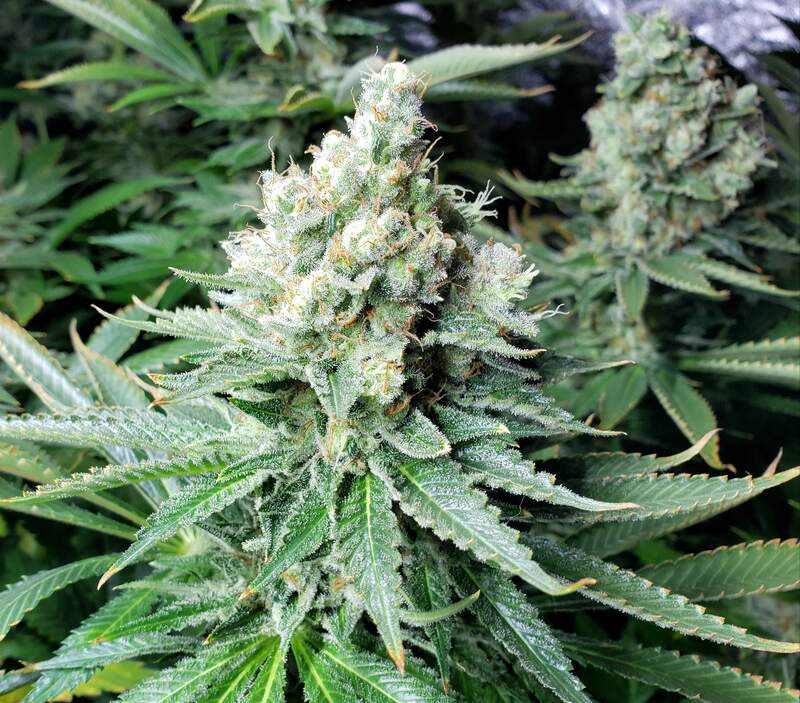 I'm not a botanist to answer the question on when to start flushing, I myself start 2 weeks prior to harvesting (around week 7, but then I'm in soil), but I do want to recommend you Harley Smith. You can find videos (1h long and 1 minute short) of him talking about allmost all aspects of growing, you won't regret it, tons of knowledge! He talks about flushing in a way you get the idea whether you should or not flush and when. Johnny! Ur on fire buddy - she looks great. :ok_hand: Think most of what you want answer to is covered in the comments but there’s 200 of em and I’m already daunted by the awesomeness of those buds:+1:Lol. Agree with the guys above - ph’d Water is all good. She’s starting the fade and lookn great. 2 weeks is more than enough flush time in coco and u can def. get by with only 1 week if you want. No worries there as the medium doesn’t retain residual nutes the way soil does. As for harvest - dry tent and oscillating fan is a good idea - keeping light airflow around the buds definitely helps avoid moisture issues and bud rot I do treat this as environment dependent though and won’t use a fan if humidity is extremely low (like my basement is).. lots of options for the trim - I’ve found wet trimming to be the easiest “once and done” prior to dry and cure but lots of guys will dry trim the sugars absolutely. @TheBudWhisperer, I think its in there somewhere too but theres so many comments! lol which is awesome no complaints. I think i have a decent grasp of harvest here its just my mind is racing with 100 things as i dont have the experience yet but i'm sure all will be fine with the help of my fam jam here. the only thing i couldn't really find is how to know when to start the flush. today is flower 61 and the rated flower time is 70-75. I think Im worrying too much about exact days here. Dont see any amber trichs really anymore and actually see lots of new white hairs on lots of colas so i'm guessing the early brown hairs must have been nutes too high. still see lots of clear trichs so its all good is my guess. cant belive harvest is 2 weeks out!!!!!! !